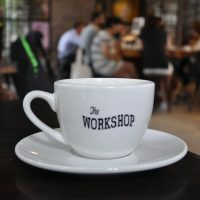 The Workshop Coffee, right in the heart of Ho Chi Minh City (Saigon as was) was the one place that everyone said to visit. Tucked away on the top floor of an old building overlooking the main street of Đồng Khởi, it’s a glorious place, open to the roof, which soars high above and with windows on three of the four sides. Although the building’s old, inside it’s very modern, with a post-industrial look and feel, full of exposed brick, concrete floors, iron window-frames and with multiple lights hanging from the ceiling. In this respect, it could be any coffee shop in any number of cities around the world, a warehouse loft in Brooklyn or Shoreditch for example, making it part of the global phenomenon of speciality coffee. This is followed through with the philosophy of its coffee, with direct trade at its heart, roasting high-quality single-origins in small batches on-site. At the same time, it’s a very Vietnamese establishment, with an overwhelmingly local clientele and staff. The coffee too, is predominantly Vietnamese, the Workshop championing local Arabica growers, roasting them either as single-origins for filter, or blending them for espresso with other high quality beans from around the world. From the outside, The Workshop Coffee looks fairly unpromising. Yes, the two ladies flanking the gates are impressive, but to their right (your left) is the empty shell of a shop. Is The Workshop still here? However, have faith: like many Vietnamese coffee shops, The Workshop’s upstairs, on the top floor in fact. Let’s get climbing. After four flights of stairs (it’s a tall building!) you arrive on a spacious, light-flooded landing, the welcoming door of The Workshop to the left. It has one of the most delightful coffee shop interiors I’ve seen in a very long time. Bright, spacious and above all, when it’s 30⁰C with 90% humidity outside, airy. Open to the A-framed roof soaring high above, it’s a large space, the air conditioning aided by four massive fans, suspended from the roof, all whirling away. A small seating area outside on the landing with three two-person tables caters for smokers. You enter at the back/right, through a large glass door. The focus is the magnificent island counter which runs front to back, offset towards the right. There’s space at the back for a large, communal table to squeeze in behind the counter, while to your left as you enter, a bar runs along the right-hand wall, mirrored by seats along the counter. There’s a large window here, overlooking the stairwell, plus a triangular one at the gable end of the roof. A row of tall windows runs along the front, interspersed with blank walls, with a row of five three-person tables alternating between windows and walls. There’s a similar arrangement on the left-hand side with another five tables. The space on the left, between the counter and the tables along the wall is occupied by two large, communal tables, generously equipped with power outlets. The smaller one, towards the front, seats eight, the other having space for 14. At the back, immediately to the right of the door, is the roaster, while next to that, running most of the width of the back wall, is a mezzanine level which acts as office/admin space. Beneath that, behind tall glass windows, a glass door and brick pillars, is a function room/seating area. To the left is a presentation/display area, while to the right is another communal table, plus a two-person one. When it comes to coffee, The Workshop is as on-trend as its look and feel. There was a choice of two Vietnamese coffees on filter, plus a third single-origin (from Burundi), all available as V60, Kalita, Kone or Woodneck filters for pour-over plus syphon, cafetiere or Aeropress for immersion. You can also have traditional Vietnamese cup-top filter. Alternatively, there’s the usual espresso-based options, using The Workshop’s blend of a Vietnamese single-origin and a Panamanian Finca Santa Teresa. The Vietnamese coffees are grown in the Dalat region, with different varietals for filter (Bourbon and Catimor) and espresso (Caturra). I started with the Bourbon through the Woodneck filter at the barista’s recommendation, my coffee served as it should be, in the carafe with a cup on the side. Interesting, the waiter had already poured some of it into the cup for me. The general service was excellent too, with a glass of water arriving on my table and being constantly topped up throughout my stay. My pour-over was reminiscent of the Chinese-grown coffee I had in Shanghai, with a certain robust earthiness to it. It matured as it cooled, bringing an underlying fruitiness which took over from the earlier robustness. If this is representative of Vietnamese-grown speciality coffee, I’m looking forward to trying a lot more on my trip. I followed this with a double espresso. It had something of the same underlying robustness as the filter, but with a sharp acidity that I was less appreciative of. Fundamentally, though, it was a fine cup of coffee. As with everything, The Workshop’s food has a western feel, with all the usual favourites, plus a pasta-based lunch menu and a small selection of sandwiches. As it was, I succumbed to the Eggs Florentine, which was slightly different from what I’m used to (although accurately described in the menu). Served on a bed of spinach, rather than the traditional muffin, there’s a hot, crusty roll on the side instead. The other addition is a layer of mozzarella on top. All in all, I rather like it this way! This entry was posted in Breakfast, Cafe/Roaster, Cafes, Evening Opening, Ho Chi Minh City, Island Counters, Laptop Friendly, Late Opening, Lunch, Retailers, Roastery and tagged include, Saigon 2017 by Brian Williams. Bookmark the permalink.